This quilt started out as a joke…but then I couldn’t stop thinking about it! Within a few days a plan was written out, and fabric was being cut. Since we are Seahawks fans (go Hawks!) I made it in blues and greens. I actually made 2 versions of this quilt…the first one was claimed by Boy #2 down there before it even had binding. So I made another quilt for Boy #1 using more lime green. I’ve had so much fun imagining this in other team colors (yes I spent way too much time thinking about this!). 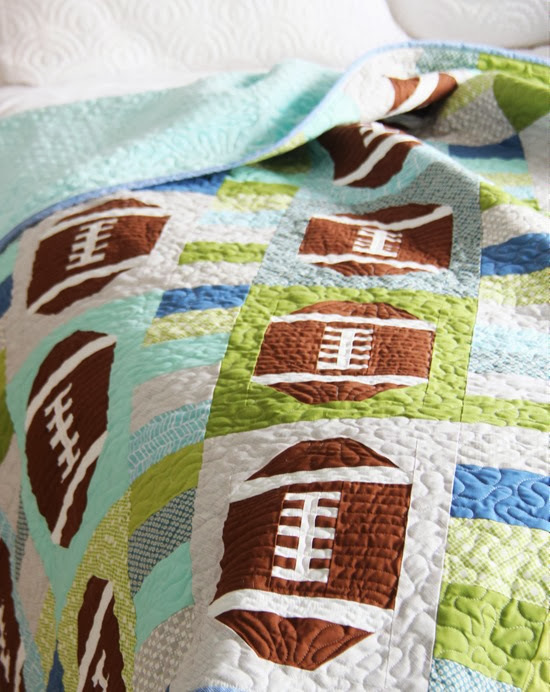 So whether you love the Buckeyes or the Broncos…it still makes an awesome quilt. The pattern comes in a Kid size (a perfect couch quilt for a child…the layout shown above) or a Throw size. This one was backed with an aqua minky fabric and quilted by Kathy. If footballs can be cute, these are so cute! This pattern is in my shop here as a PDF, or here as a Paper pattern. After a little hiatus from doing patterns it feels good to get something out of my head and published. Oh my gosh! I am in love with this quilt!! I am making it in BYU colors tomorrow. Thank you! this would be perfect for my neview! Wonderful design! It will be a great succes!!! Super quilt pattern! I know a bunch of guys who would love this! Love it! I'm just finishing up a Shortcake quilt and have a Dottie set for the long arm. Oh wait, the bed quilt I have that needs to be quilted is Easy Bake. Hmmm……never realized that!!! I guess I really DO love your patterns! Thanks for keeping me busy! Love this pattern! One for the boys. Go Seahawks!! In my house, these would be Eagles and Patriots colors. Great pattern. So clever! I love it! GO SEAHAWKS!!! We're having a Super Bowl Party – come on over! This quilt is absolutely adorable!!! My 5 year old grandson from Bothell would love it. Nice job! Love, love, love this! Ordered and on the "to-do" list. And, Go HAWKS!!!! Love your idea. Keep thinking. I'll be buying lots of green and gold fabric. 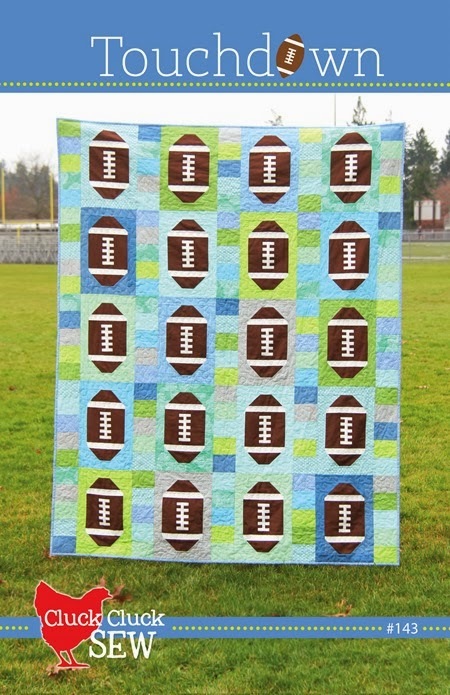 This quilt makes me wish I liked football!!! What a great guy (and gal) pattern. My daughter's FIL just died unexpectedly in December or I'd be making one for him, for sure. I may have to make one for another of my daughter's gal friends. that is awesome & super creative!!! This is perfect! I am making this for my 32 year old son. We are Seahawk fans of course, living in Kirkland, WA. GO HAWKS! I predict this selling well. My 13 yr. old loved it. Too darn cute! My 'big boy' 21 years old would love this! I won't get it done by the big game where we crush Denver but maybe by next football season! GO HAWKS. So cute…great 'guys' quilt…both big and small!!! Oh gosh – must.buy.now! We are big seahawk fans here too and I have two boys so I always looking for things they would like. This is perfect. Thinking I'll be making at least one in seahawks colors…. And then Oregon state beavers colors…… Yes!!! Love it! Seahawk fan from DAY ONE! Go Hawks!!!!! Awwwhhh…YOU DID GOOD! Such a cute idea! I bet my little GB would love this! I love this! Can't wait to put one together! Do you remember the solid you used for your footballs? It's the perfect brown! Ok – this is just adorable! I think I'm going to need both a Georgia Tech one and a Colts one! Oh, I better not show my honeyman or this will have to be the next quilt on my list. I love it! Freaking bought it!! For ME!!!!!! LOVE IT!!! I'm making ASAP!!!!! Yay!!!! oh my goodness! I have to make this for my son-he plays football! Any thoughts on how to make it bigger for a twin bed? So fun!!! I love it! A really really cute pattern and I love the Seahawks colors. But, I live in Colorado, so I have to say . . . Go Broncos!! Oh Allison, this is way beyond darling! What boy/man wouldn't want such a great quilt. Perfect! My daughter and SIL live in Seattle so they are BIG Seahawks fans. 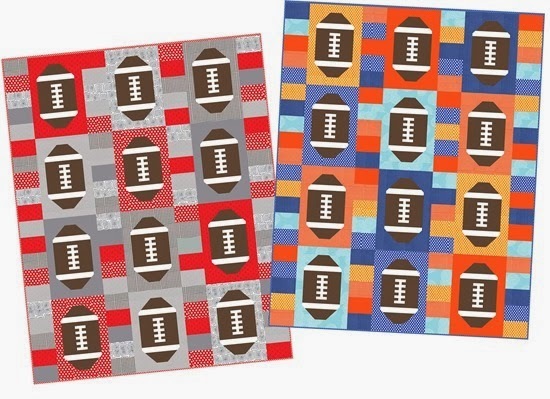 I will have to make this football quilt for them. Great pattern! I love this Quilt! Love the colors! this is so cute Allison!!! starting the looking in pattern for the little guy and making it as an eye-spy quilt… now you got me debating whether to do the football one instead! love that you are back to making patterns, love each and every one of them! Sorry but GO BRONCOS!!! With two grandsons I know this quilt will be fun. Thanks! I emailed Kimberly at fat quarter requesting a kit. I love it. Want to make it for Father's Day……..the colors are perfect…he's a Seahawks fan…..hope she can get the kit together!! If she can't….still making it. So cute. Thanks always hard take stuff for the daddy's. For all those that want to make this a Twin size I'm going to put this in the comments in case it helps anyone! This is actually fairly easy to make bigger for a Twin…it just didn't fit with the layout of the pattern! I would just add another row of footballs on the bottom, and another 2 rows of the 4 1/2" strip blocks on each side of the quilt. Every 3/8 yard makes enough for 2 football blocks and some rectangles…so you'd need about 2 more 3/8 yards plus a whole bunch more 3 1/2" x 4 1/2" rectangles for the sides. Buy an extra 1/2 yard of the brown and white and you should be good to go! I wonder if I can mix up the football to make it look like an Australian Football. I will have to have a go. You are so creativ! What a great idea! Here in Europe football is not as common, but the quilt is just a dream! I think every little boy would be thrilled!!! It's brilliant, will be buying this pattern to make a quilt for my American friends. I love this. I think I have just added 2 quilts to my list (for my boys). Thank you…. but Go Broncos! 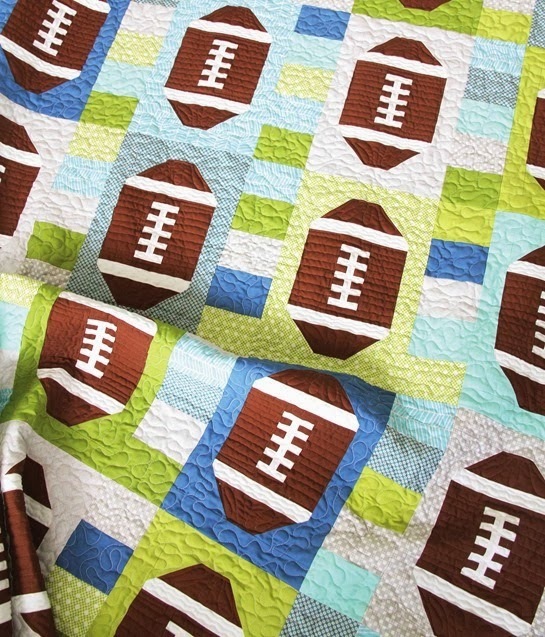 Oh my gosh ~ my dil's nephew is a big football fan and he'd love this quilt (I do too)! I just ordered it to make for next Christmas. I'll be doing it in his favorite football team's colors! Can't wait!!! Ingenious! Stunning! I love this quilt, Allison! You are truly a gift! I'm also really sad that I start a new job on Monday and doubt I can get it cut and stitched up by next Sunday! This is a great pattern! I love how easily it can be customized for team colors. Ok, so I do not like sport. At all. Any sport. It puts me to sleep. But even I think those footballs are really cute. Well done. I wish I could choose a bigger font for my comment because THIS QUILT IS ADORABLE ! Seriously….what a way to come out of hiatus……and good timing too, right before next weekend's big game ! It's cutesy here, but could be 'manned up' for the big guys. You are GENIUS ! Beautiful, something for the boys. My grandsons will love this one. This pattern is just perfect Allison! I love it in Seahawks colors, even though I'm a Colts fan :) Love all of your designs. What a great design! Perfect for our peewee league's coach, he just had twin boys. Go Hawks! I live in Denver, but couldn't care less about the game- even so, LOVE this pattern! So cute! I LOVE this as would so many guys and a little gal I know. Since our team isn't in the big game we're cheering on the Seahawks! Good luck with this pattern, bet it will be a smash. I know I'm off to purchase it! Wonderful pattern, that's my kind of thinking and your button quilt is adorable too, great job!! Those are the cutest footballs ever! I am so insanely in love with this pattern! I wish there was a possibility of getting one made before the Broncos win the Super bowl ;-) maybe next season I'll get it done. 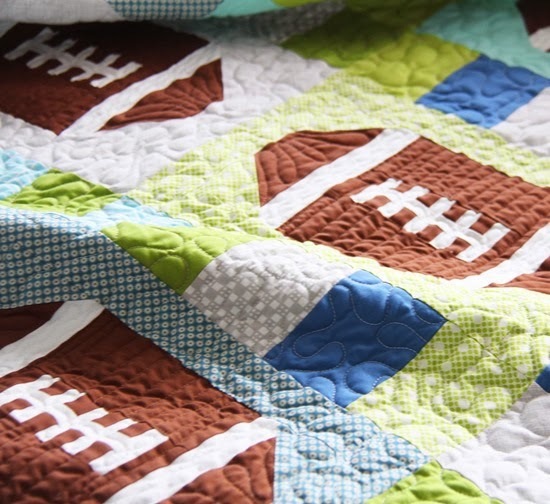 Make a basketball quilt pattern that is a cute as the football pattern. I would be forever in your debt. Go Jayhawks! I love this and I especially love the minky on the back! I know of several little boys that need this quilt! Guess I better get busy! I just had to make this for my son! I am just getting to piecing the footballs and was wondering if you reccomend pressing open or towards the drown. THanks! It was love at first sight when I saw this pattern. I knew I had to make it for my favorite little football fan but just not in Seahawks colors. 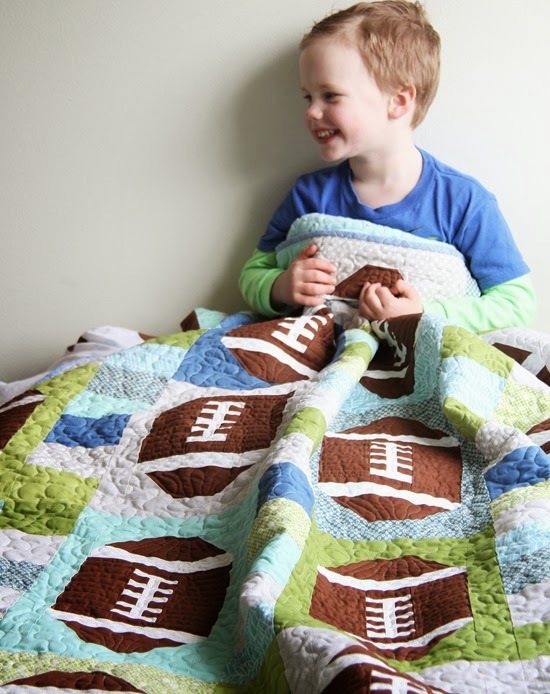 Sorry, we’re Bears fans and the best part about this quilt was selecting all those blue and orange fabrics and seeing my little boy’s sweet smile when I presented to him on his 4th birthday. Love your work! Thank you for all your inspiration. Oh what a fun birthday present for him! I’m so glad it turned out great! I love this pattern. Have made 2 in school colors for each of my grandsons and 2 baby in green and blue. How fun! This is a great one in school colors!